Can you really take something that’s already amazing (near perfection) and make it even better? Hint hint: The answer is “yes!” as evidenced in today’s post. Around this time last year, I made the brave decision to stop the buying expensive green bottles of astringent I used to help clean and freshen my skin (at least that’s what the astringent claimed to accomplish). The $45 bottle of lab-formulated, skin-perfecting facial toner didn’t seem to help my skin at all. It only took a good 12 months (that’s nearly $540–yikes!!) of monthly visits to the mall to realize I may want to rethink the toner game. It was at this time (and with a lot of research on natural skin solutions) that I discovered an amazing remedy already available in my pantry: apple cider vinegar. 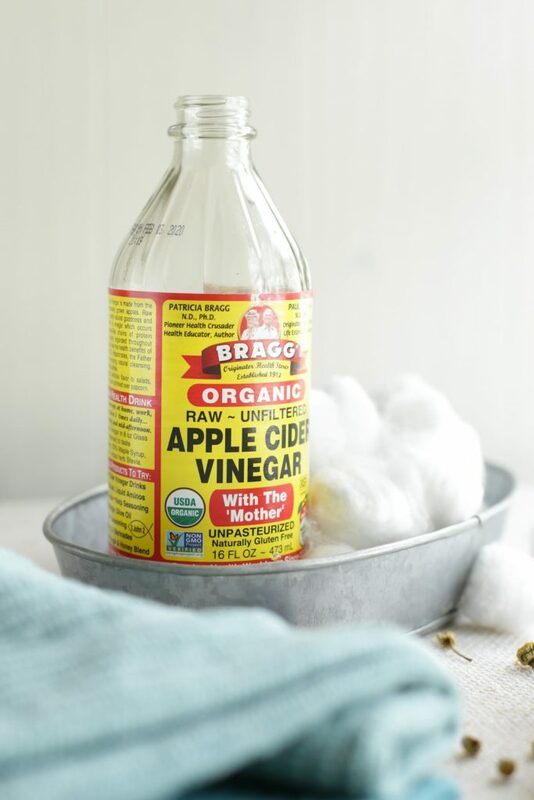 Apple cider vinegar, in its raw form, is a natural antibacterial and antiseptic solution, which in non-fancy terms simply means this simple ingredient can help fight bacteria, germs, and even mold! And it only costs $4 for a large bottle! Since smelling like a freshly tossed salad wasn’t an option, I decided to create a simple homemade astringent using water and raw apple cider vinegar, along with a favorite skin-friendly essential oil. Within a few weeks, the benefits of daily homemade astringent application were quite evident. My skin felt clean and looked radiant. And the best part? My troublesome break-outs started to disappear. Plus, I was actually saving money! 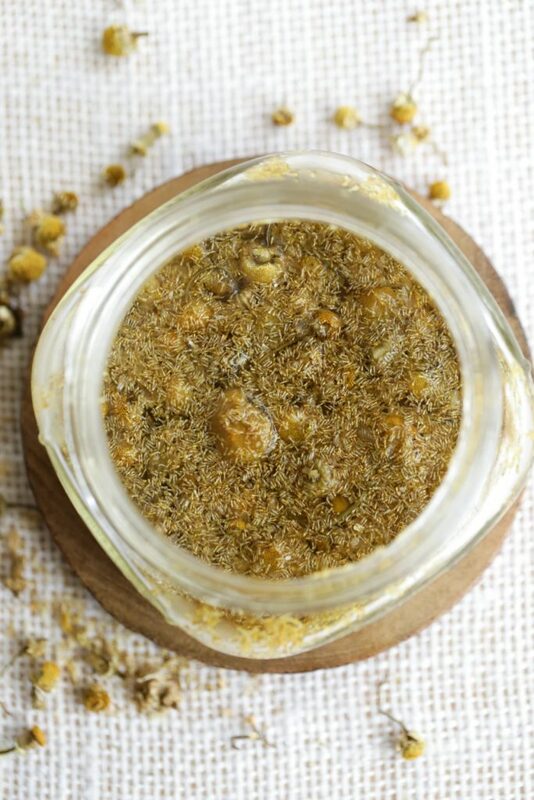 Chamomile is one of my favorite herbs for creating skin-calming recipes. That’s right! The chamomile tea bags purchased at the store are good for so much more than just a good night’s sleep. Chamomile contains flavonoids which help to protect the skin from free radicals and damage from the sun or other environmental influences. 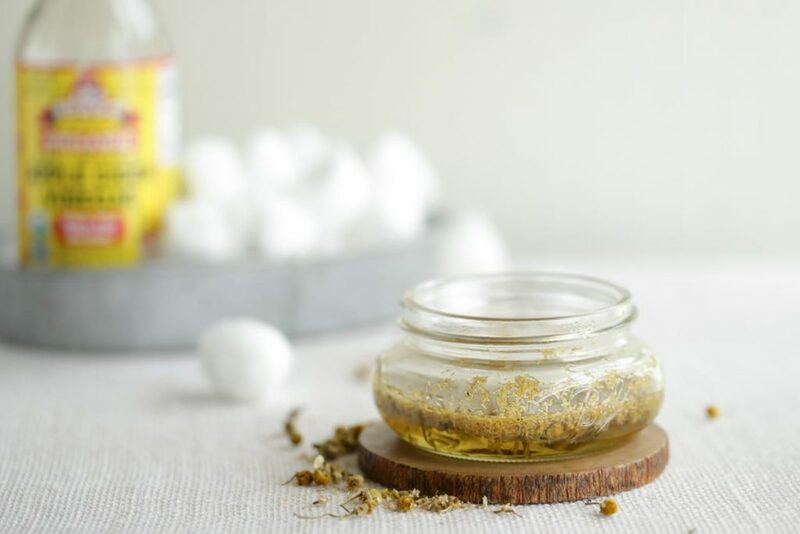 The soothing herb may be used to help heal frustrating skin conditions, such as: rashes and acne, making it the perfect ingredient for sprucing up my already beloved astringent recipe. 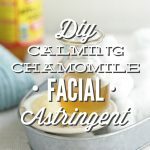 DIY Calming Chamomile Facial Astringent sounds complicated, but it’s really a simple creation made with only two main ingredients: chamomile tea and apple cider vinegar. The only hard work involved in making this low-cost, highly-effective recipe is steeping and filtering the tea. 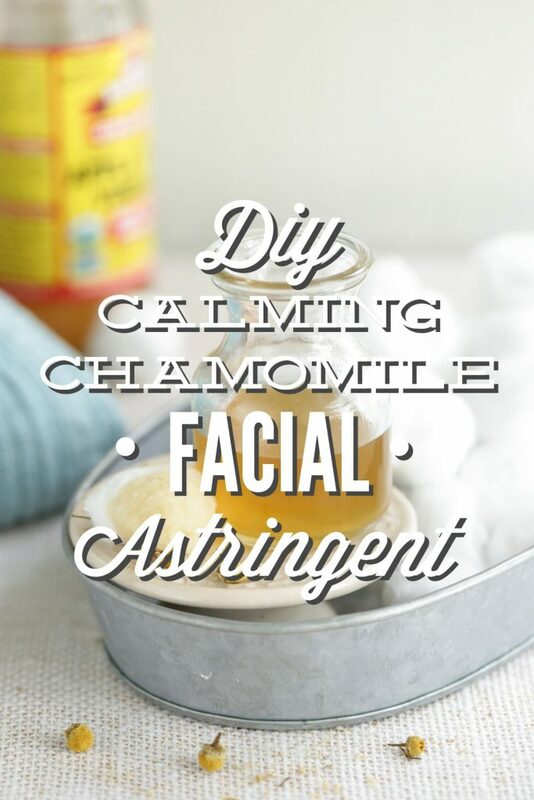 If you can make tea, you can make this skin-calming homemade facial astringent. Trust me, your skin will be ever so grateful! 1/4 cup water Distilled water is best for do-it-yourself projects. Warm the water. Remove the water from heat source. Add the chamomile flowers (or tea bag) directly to the warm water. Let the tea steep for 5-10 minutes until it's a rich gold color. 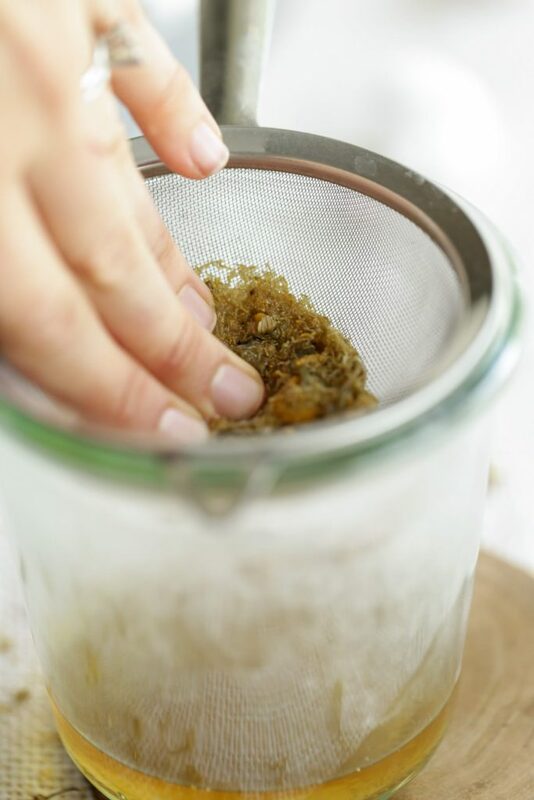 Using a fine mesh sieve (I use this one), strain the chamomile flowers from the liquid tea. Discard or compost. In a glass bottle with a lid, combine the glycerin (if using--it helps to disperse the essential oils in the water and hydrate the skin) and essential oils(if using). Shake the bottle to combine the ingredients. Add the apple cider vinegar and chamomile tea. Shake the bottle again. I recommend storing this toner/astringent in the fridge and using it quickly. After washing the face with a cleanser, apply a small amount of toner to a cotton pad/ball and wipe the face. I also like to follow-up with a moisturizer. Store the toner in a cool, dark place (like a medicine cabinet) in between uses. I use toner at night before bed, and simply wash my face with water in the morning. Frankincense: This oil may help to lessen the appearance of scars, and improve the overall condition of the skin. I also love the scent of frankincense, so it’s a nice cover for the vinegar. Carrot Seed: This oil is high in antioxidants and helps to encourage the growth of new skin cells. I also use carrot seed oil in my homemade lotion recipe, so if you plan to follow this astringent recipe with my lotion please feel free to skip this ingredient. 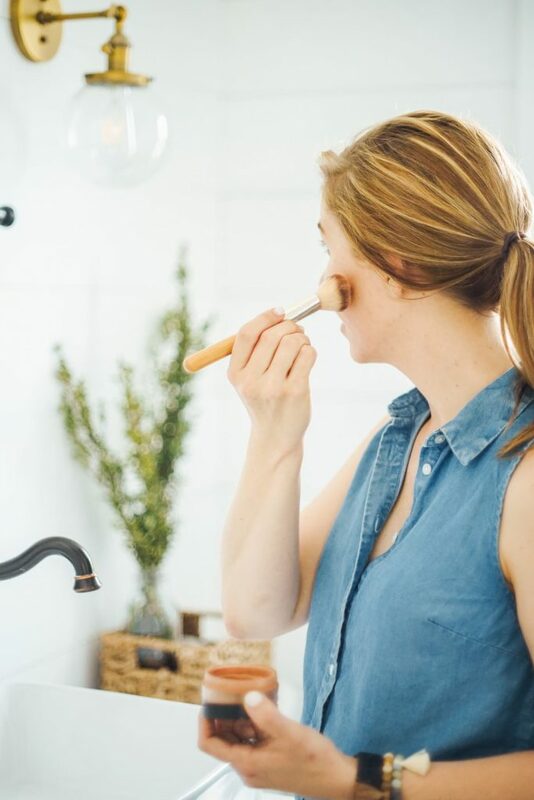 Toner vs. Astringent: Technically (AKA: chemically) speaking this recipe is a toner due to the addition of a gentle herb; however, I personally believe this recipe is a great mix between a toner and an astringent: cleansing pores and balancing pH. You all are wonderful bloggers! Thanks I can’t wait to try this one. Why only 7-10 days does it go bad? Hey Rachel, The tea and vinegar mixture develops a scent that’s not very pleasant after about 14 days. I’ve found that a 1/3 cup usually lasts (with a 1-2 times a day application) about 10 days. I think 14 days would be just fine, or until you notice a funky scent :). I haven’t tried storing this recipe in the fridge, but that may help preserve it a bit longer. Hey Kristin, I was just wondering why you would use chamomile leaves and not chamomile flowers? Thanks 🙂 Love this blog! Hey Gemma, Yes, you want the flowers :). 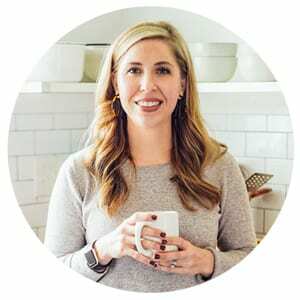 I’m so glad you’re enjoying the blog! Hi,i think I’m obsessed with this site! …question -(yes i have many of those)can i use Chamomile drops instead of tea or flowers? Hey Hela, I’m so glad you’re loving Live Simply!! That’s my goal ;). Yes, you may add Chamomile essential oil to the toner/astringent in place of the infusion. The oil will work great! Hi Kristin, is is possible to avoid the Apple Cider? I don’t like the smell of it or is there a substitute? Thanks. Hey Charu, You could skip the apple cider vinegar and still make a very calming toner. Just the two ingredients I was looking into. Was wondering since oil and water don’t mix, does the ACV act as the emulsifier? I know this is rather old in terms of blogging but how long would you recommend we could keep this? I have tea every morning so it’s very much possible for me to make this daily, would that be best?